The Weaver Navigation (about 19 miles in total length and 50 feet below the Trent and Mersey Canal) has much to interest boaters: deep water, wide channels, helpful lock keepers, varied rural and industrial scenery – and even a few other boaters. In an entire day Cleddau has passed four other moving boats, a few moored up with chimneys smoking as an indication of residents – and three canoeists. There are two rowing clubs at Acton Bridge and at Runcorn, not that any rowers were out on the water today and no sailing clubs. 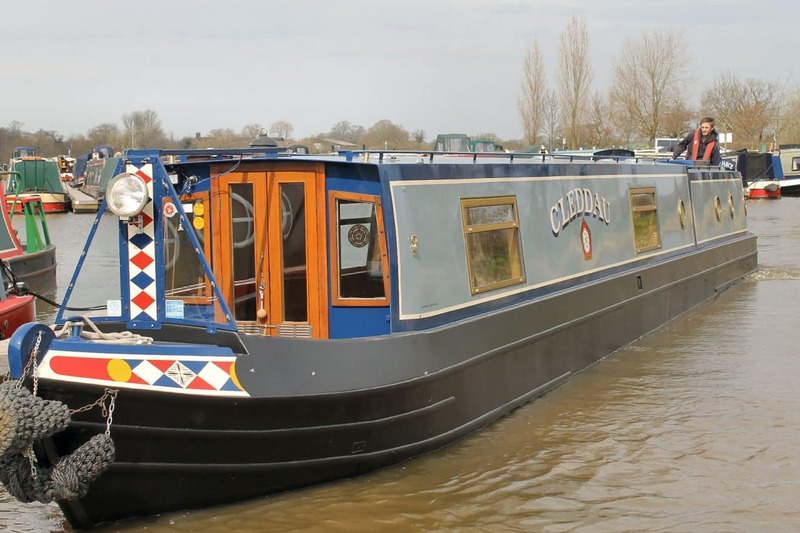 So the Weaver is a spacious waterway, with none of the jostling for space at bridge holes, the squeezing past moored boats or the challenge of finding an overnight mooring in over-popular areas. The cruise today started mid-morning (from about three miles below the top end of the navigation), took in two locks, a pause at Northwich for water, rubbish disposal and small grocery restock, continued past the Anderton Lift and then it was onto new water. Once past the chemical works at the bottom of Anderton the waterway takes on a flood plain appearance. There were footpaths beside the river and leading up to the tree-lined ridges; there were meadows, a small caravan park and only occasional housing and longer, deeper locks. Sometimes the waterway course took us through a sheltered channel but at others we surged into a brisk northerly wind, wavelets lapping at the bow and sides. Cleddau surged on, Relief Captain and Boatwif looking (unsuccessfully) for Devil’s Garden moorings . Keep going – reach the end. This was Weston Cut now. Runcorn came: harsh looking bridges, pylons, Runcorn Rowing Club, then the most enormous boys’ own chemistry set, which extended on – and on and on. Ahead lay Marsh Lock, a floating pontoon beside it. All four explorers disembarked, walked to the end of the lock and gazed upon a bend in the massive Manchester Ship Canal. Beyond lay the River Mersey. The boat was turned and with her stern to the wind the boat – and crew – cruised a mile or so back to Sutton moorings. So, it’s been done, the Weaver Navigation from top to tail – and those readers familiar with the L-shaped settee arrangement on Cleddau may be intrigued to know that the Relief Crew, after fitting the seven jigsaw pieces of foam together last night to create a very long (though narrow) double bed chose to sleep top to tail – and have pronounced the bed pretty comfortable!